We’ve all seen the typical ‘urban youths in sportswear on a council estate‘ photoshoots, but a recent immersive event in London took it one step further. 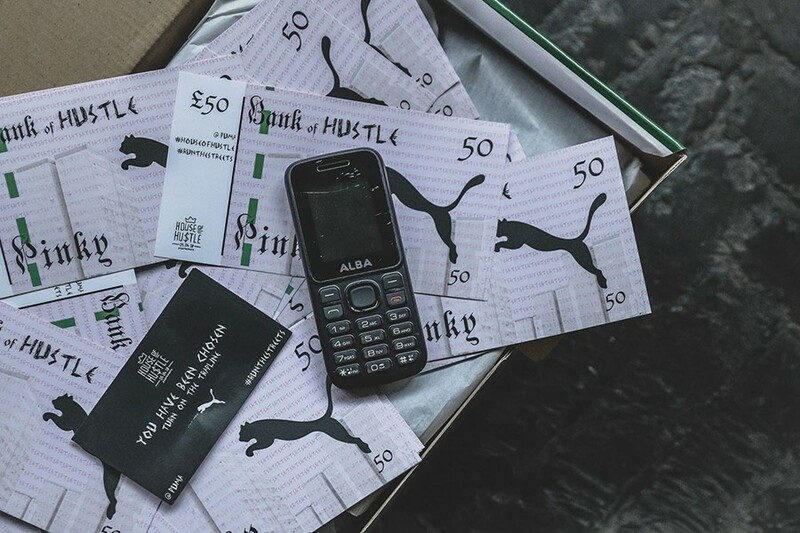 Puma’s ‘House of Hustle’ party (thrown in partnership with JD Sports and marketing agency Urban Nerds) took place in London’s affluent Soho area last week, with invitees being sent Puma shoe boxes full of fake £50 notes and sketchy-looking business cards which instructed them to ‘turn on the trap line’. In other words, turn on the ‘burner’ phone they’d been sent, which came with a preloaded message reading “Yo G what u sayin today? Pass tru the House of Hustle.” Trapping, in case you're not familiar with the term and Puma's drug-dealing starter kit hasn't made it clear, is the selling and dealing of drugs. The trap house itself was covered in graffiti, with blacked out windows and dirty mattresses strewn on the floor, while drill acts including Loski performed and tattooists and barbers offered guests fresh ink, trims and grills. There’s something slighly...weird...about a brand doing this – yes, the glamourisation of drugs is nothing new, but a determined focus on class (and perhaps race) makes it a strange thematic choice, particularly given what’s happening to London’s working class youth right now. Coutts went on to detail what is currently happening on the streets of London amid extensive police cuts, social unrest and far-reaching poverty – on the night of the party, there were ‘six stabbings in 90 minutes’, with most involving teenagers or young adults. The letter has received support, with many posting comments expressing similar feelings towards the party’s theme. “As someone who has lived through the things they are glamourising here I rly appreciate this post which is something I could have never articulated. It’s grim to see my childhood used as a marketing tool when living through it was traumatic and still haunts myself and my family today!” commented @damngeorgina, while others including musician Kindness (Adam Bainbridge) called for a boycott of Puma and its products.